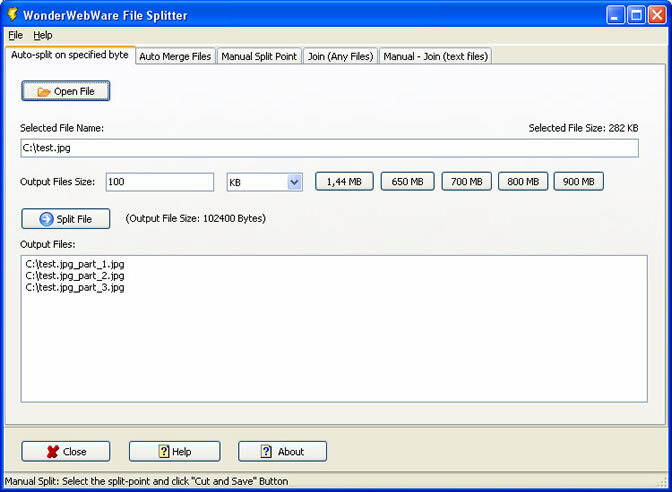 File Splitter Pro is a tool that will split large file into pieces of any selected size and naturally — with the same tool you can merge these pieces back into one large file. But it comes also with unique text-splitter function whichcan be used to split large text files (MySQL dumps for example). 30-days free trial version available for you to test all the features on your own. Pro vs. Free Version | Why purchase? and search for "Melanto File Splitter"
With the full version you will get rid of the startup trial-version reminder and the purchase buttons..
Because the pro-version is commercial software, you'll get the standard email support we all expect from software vendors. This is nice option, I think, and I provide it here because I made the decision to provide this advantage for all customers of any of my commercial (non-free) products. As a pro-version user you will get all updates and upgrades of the file splitter free of charge for one year. I don't sell directly, so — I will never see your credit card info. The payment process is secured by the payment service provider.